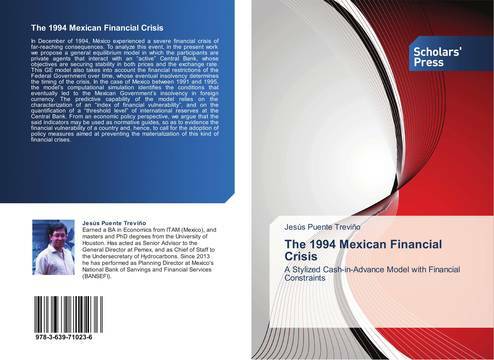 In December of 1994, México experienced a severe financial crisis of far-reaching consequences. To analyze this event, in the present work we propose a general equilibrium model in which the participants are private agents that interact with an “active” Central Bank, whose objectives are securing stability in both prices and the exchange rate. This GE model also takes into account the financial restrictions of the Federal Government over time, whose eventual insolvency determines the timing of the crisis. In the case of Mexico between 1991 and 1995, the model’s computational simulation identifies the conditions that eventually led to the Mexican Government’s insolvency in foreign currency. The predictive capability of the model relies on the characterization of an “index of financial vulnerability”, and on the quantification of a “threshold level” of international reserves at the Central Bank. From an economic policy perspective, we argue that the said indicators may be used as normative guides, so as to evidence the financial vulnerability of a country and, hence, to call for the adoption of policy measures aimed at preventing the materialization of this kind of financial crises.